Josh Caulder, Eric Edwards, Kaitlin Flak, Erin Huml, and Katie Jackson from theBellarmine University Physical Therapy Program's Pathophysiology of Complex Patient Problems Project. A case study on 67-year-old male diabetic with end-stage renal disease receiving dialysis. The objective was to provide physical therapy intervention to a patient receiving dialysis. The patient’s chief complaints included decreased balance, loss of sensation, fear of falling, and decreased endurance during activities of daily living due to the effects of dialysis treatment. Objective measures during evaluation validated these complaints. 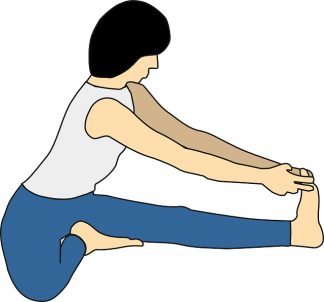 The patient’s goals were to improve strength, aerobic endurance, balance, and flexibility. Patient education was emphasized during each treatment session. The patient progressed through physical therapy as indicated in the plan of care, with improvements in deficits found during examination. Patients receiving physical therapy during dialysis treatment may have more positive outcomes than those who elect not to participate in therapy. Patient presents with complaints of generalized weakness, impaired B LE sensation, decreased balance, and decreased mobility secondary to dialysis treatment 3 days per week. Patient was admitted to the hospital in April 2009 due to extreme illness and diagnosed with kidney failure. 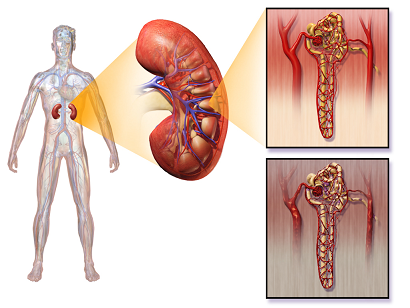 Patient reports progression of his disease to end stage renal disease (ESRD) in October 2014. Patient has been receiving dialysis treatment since ESRD diagnosis. Comorbidities include Type 2 DM, diabetic neuropathy, HTN, and, depression. Patient also reports frequent UTI’s since going on dialysis. Patient reports that he has difficulty with walking, stair negotiation, and getting in and out of his vehicle. Patient states he would like to be able to walk and negotiate stairs with less fatigue and less risk of falling. Patient would also like to be able to get into and out of his vehicle with greater ease in order to go to his dialysis treatments. Diabetic Foot Screen: 2 with redness and dryness - indicates loss of protective sensation with poor circulation. Our impression of the problem: 1) The patient’s end stage renal disease is incurable, but is being treated through the use of dialysis which causes secondary functional deficits including decreased endurance, decreased strength of upper and lower extremities, impaired balance and coordination, decreased sensation, diminished reflexes, and decreased flexibility. 2) The patient has the following risk factors that may impede physical therapy intervention: advancing age, diabetes mellitus, hypertension, and chronic urinary tract infections. 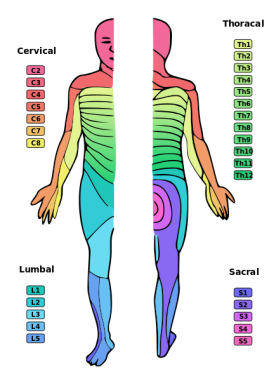 The physical therapist will need to be aware of these complications during each treatment session. 3) Patient has LE weakness, decreased balance, decreased sensation, and fear of falling which may contribute to his increased risk of falling. Patient presents to skilled physical therapy with complaints of impaired balance, loss of sensation B LE, and decreased endurance during ADL’s secondary to dialysis protocol. Patient demonstrated general LE weakness indicated by MMT, dec AROM in R UE secondary to fistula insertion, and a sensation rating of 2 as indicated on the Diabetic Neuropathy Screen. 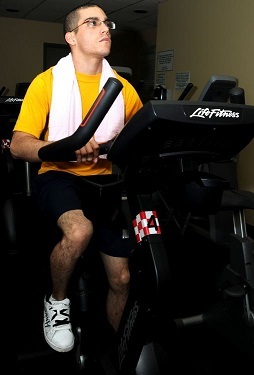 PT to implement an aerobic program utilizing a stationary bike to improve endurance in home and community settings, balance and gait training to address loss of sensation and proprioception awareness to decrease fall risk, and LE strength and flexibility program to address deficits for improved mobility during functional tasks in a home environment. Our goal was to progressively challenge our patient’s endurance by progressing both the duration of the activity and exercise intensity. We chose to utilize the Borg Rating of Perceived Exertion Scale to correlate with intensity level rather than heart rate max due to our patient being on hypertension medications that would blunt her heart rate response to exercise. We utilized ACSM guidelines for resistance training to prescribe sets and reps for our patient. We progressed his strength training exercises based on his response to activity. Pt. improved aerobic endurance as indicated by significant change in score (MDC = 58 meters) from 550 meters to 635 meters on 6 minute walk test following 12 week physical therapy program. Pt. also increased their perceived physical function as indicated by a change of 30/100 to 58/100 on the SF-36 (MDC = 28). Pt. increased their balance as indicated by a change of 40/56 to 46/56 on the Berg Balance Scale (MDC = 4.9). Pt. improved gait speed from 0.86 m/s to 1.09 m/s (MDIC = .13 m/s). This classifies the patient as a community ambulator (>.8 m/s) Pt also improve TUG score from 24 seconds to 14 seconds, demonstrating increased functional lower extremity strength and decreasing his fall risk. The MDIC for the TUG is not established, however >15 seconds places a patient at an increased fall risk. Patients undergoing dialysis treatment are at a high risk of impaired physical function and mobility, which are strong predictors of disability, hospitalization, falls, and death and are often associated with poor outcomes. Complications commonly encountered in this population of patients are peripheral neuropathy, congestive heart failure, heart attack, stroke, and amputation. Lack of motivation and interest are also common barriers to increasing physical activity with this population of patients. Dialysis patients frequently report generalized weakness, fatigue, difficulty with ambulation, decreased range of motion, pain, and difficulty with ADL’s which are all indications for physical therapy. In addition, patients on dialysis have reported significant reductions in their quality of life. Physical therapy can be appropriate for patients on dialysis treatment because it can be an important factor for improving quality of life through physical function and mobility while addressing many of the common complaints and impairments dialysis patients commonly present with. Research has supported physical therapy during dialysis treatment does produce positive outcomes such as; improved endurance, strength, quality of life, functional capacity, and gait speed., Research supports that limitations in ADLs/IADLs or observed mobility deficits is an indication for physical therapy evaluation and and intervention. Exercise programs in individuals with ESRD should involve mild to moderate intensity of exercise over a longer duration of time. Best Time for Exercise in the Patient Undergoing Dialysis: Exercise can be performed before, during, or after dialysis. The best time for exercise may vary and should be individualized to the patient by trial and error. Some patients have been found to have their lowest tolerance to exercise and overall function the day before the firs and second session of the week. Research has shown that patients with chronic kidney disease who are treated with dialysis have impaired physical functioning that is associated with poor outcomes. Research has also shown that patients with chronic kidney disease have decreased gait speed which is known to increase their risk for reduced survival and adverse health events. Based off research, we chose to assess his physical functioning and gait speed using clinician based outcome measures including the Berg Balance Test, Timed Up and Go, and the 6 Minute Walk Test. We also used the SF-36, a patient reported outcome measure, to asses his quality of life. Based off of our examination findings, we designed a physical therapy intervention to address the patient’s functional deficits for improved functioning during ADL’s and improve quality of life. The 6MWT (6 Mintue Walk Test) TSS30 (timed sit-to-stand in 30 seconds) and maximal and adjusted activity scores (MAS-HAP, AAS-HAP) of the Human Activity Profile (HAP) have also been found to be reliable physical function and activity outcome measures in people with ESRD. 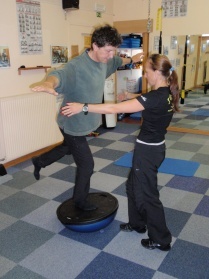 ↑ 6 Minute Walk Test: Rehab Measures Web site. http://www.rehabmeasures.org/Lists/RehabMeasures/PrintView.aspx?ID=895. Published 2013. Accessed March 29, 2015. ↑ SF-36: Rehab Measures Web Site. http://www.rehabmeasures.org/Lists/RehabMeasures/PrintView.aspx?ID=930. Published 2013. Accessed March 29, 2015. ↑ Berg Balance Scale: Rehab Measures Web Site. http://www.rehabmeasures.org/Lists/RehabMeasures/PrintView.aspx?ID=888. Published 2013. Accessed March 29, 2015. ↑ 11.0 11.1 Painter P, Marcus R. Physical Function and Gait Speed In Patients with Chronic Kidney Disease. Nephrology Nursing Journal. November 2013;40(6):529-539. Available from: Academic Search Complete, Ipswich, MA. ↑ Overend T, Anderson C, Sawant A, Perryman B, Locking-Cusolito H. Relative and Absolute Reliability of Physical Function Measures in People with End-Stage Renal Disease (2) Dec 10, PTC.